We love our live music here at L’Aubergade. This season we have been focussing on bringing new acts to the hotel from the UK. Last week we brought out London based band The Scoundrels. Well three of the group, Josh the drummer, John the keyboard player and Ned on guitar and lead vocals. The boys have been friends since schooldays and as their website states they ” shared a love of 50s soul, roots, doo wop and classic rock” ,which is clearly evident in their music today. The boys arrived very excited and safe to say they were like kids in a sweet shop with their surroundings and the snow, so much so they enjoyed a full day of skiing on one of the worse weather days we’ve had this season. They were not to be put off by some high winds and closed lifts. The boys arrived back with massive grins on their faces and full of stories about their day. 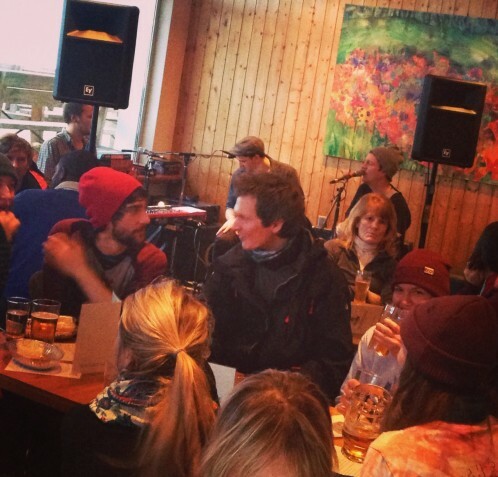 Those who came along to enjoy their afternoon après and evening sessions were entertained by their rousing semi acoustic sets and Neds ‘creative’ lyrics. Scoundrels are obviously used to adapting their sound to different surroundings and the although missing a couple of members in the band their sound was still rounded and full, with John’s amazing keyboard skills and Joshua’s versatile cajon drum and of course Ned’s bluesy guitar. We loved having the boys here, if only for a couple of days and look forward to them returning for a longer stint…. Watch this space for details.